Total Access Analyzer helps you create better, more robust, and faster Access databases with more control and fewer errors! Discover why so many Microsoft Access users and developers rely on Total Access Analyzer to deliver great Access solutions for over 20 years! Total Access Analyzer examines all your database objects to provide extensive documentation, code analysis, object cross-reference, and diagrams with over 390 presentation-quality reports. It detects 300+ types of errors, suggestions, and performance tips, so you can learn and apply Best Practices to fix problems, improve your design, and speed up your Access applications. 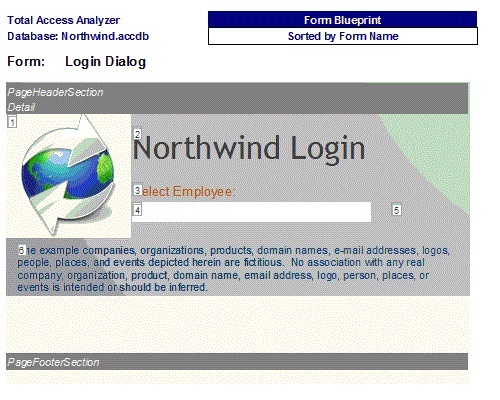 Because Total Access Analyzer runs within Access, it leverages the power of Access to document and present the results in Access forms and reports. In many places, it also offers the ability to look at the results and jump into design mode for the current record's object with a single keystroke. This lets you easily examine the results and apply the suggestions. 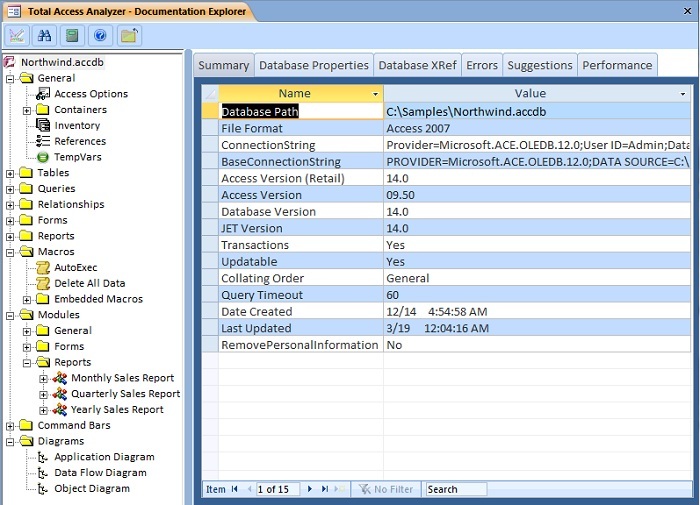 Total Access Analyzer performs detailed analysis of your Access database objects individually and as a whole. By examining your entire database, it discovers complex relationships among objects, hidden problems, and even unused objects. 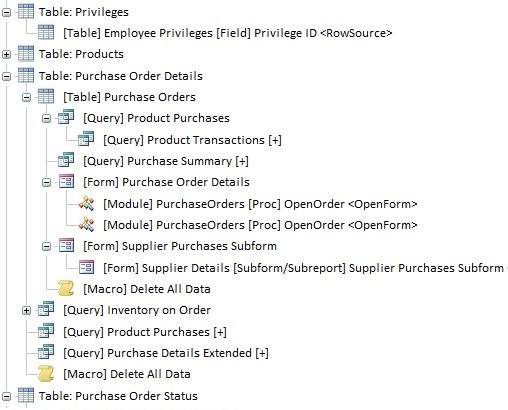 Take control of your databases by understanding how they work. Total Access Analyzer not only generates cross-references between your objects, it also creates diagrams of your application and data flow to show multi-level relationships. If you want to understand what's really going on in your database or need to get up-to-speed on databases created by others, Total Access Analyzer is your solution. Hierarchical diagrams visually revealing how objects reference each other through multiple levels. 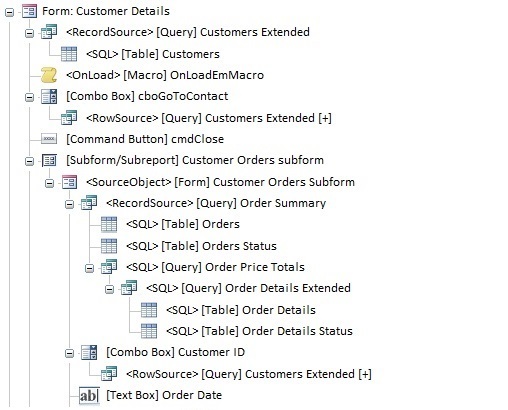 Data Diagram showing how data flows from tables into queries, forms, reports, etc. 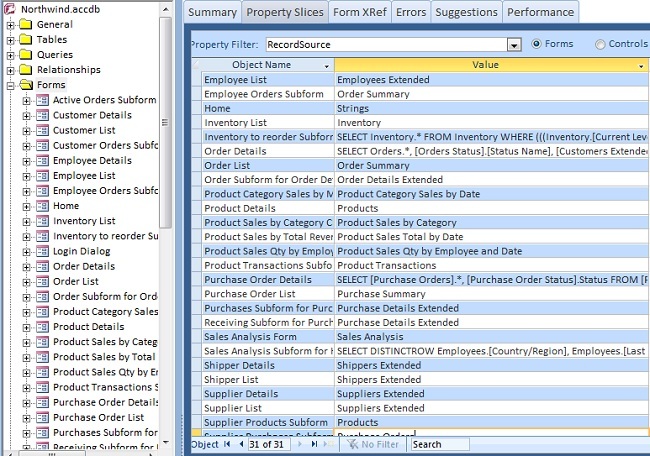 Object Diagram showing what objects are referenced by a form, report, or query. Application, Data Flow, and Object diagrams can be redrawn to show the hierarchy of a single object. The redrawn diagram can also be printed from the Documentation Explorer, allowing you to print a report of a single object's diagram. Total Access Analyzer includes our proprietary Microsoft Visual Basic for Applications (VBA) code parser that understands your module code to generate detailed analysis of your code in modules, classes, and behind forms and reports. Know where each procedure and variable is used. Discover unused code, unreferenced variables (assigned but not used), references to missing objects, variable name conflicts, scoping issues, and much more! Total Access Analyzer pinpoints issues in your code to teach you how to be a better Access/VBA programmer. Total Access Analyzer helps you apply the 'Best Practices' principles that we've learned at FMS. 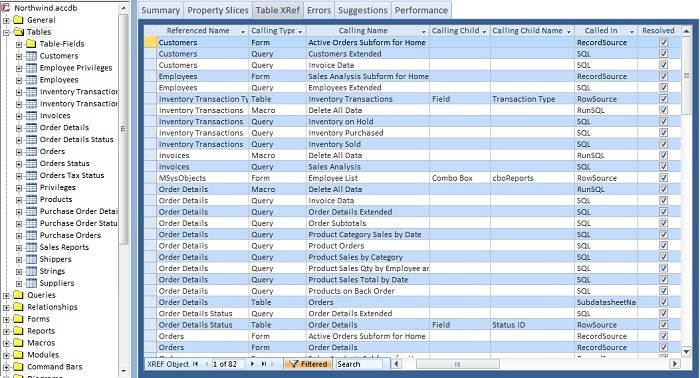 Perform the same analysis on your databases to see what you can improve. 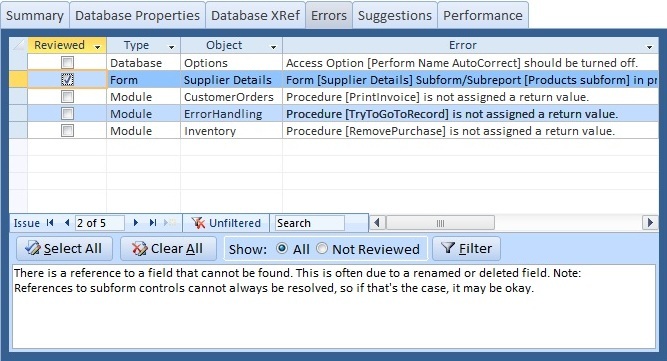 For instance, eliminate potential data loss with the field consistency analysis that ensures identically named fields across tables are defined consistently. 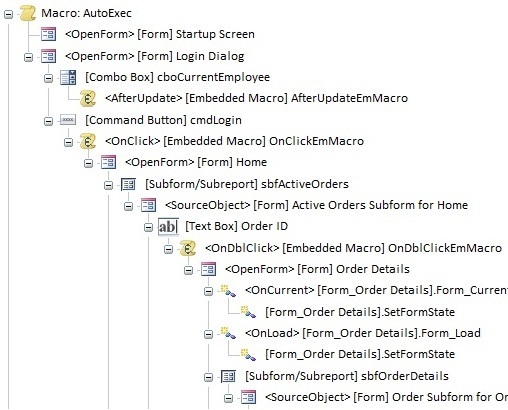 Find forms with duplicate hotkey letters, reports without a NoData event, unused objects and code, procedures that should be private, short combo boxes, and much more. You can also see property values across all form controls. 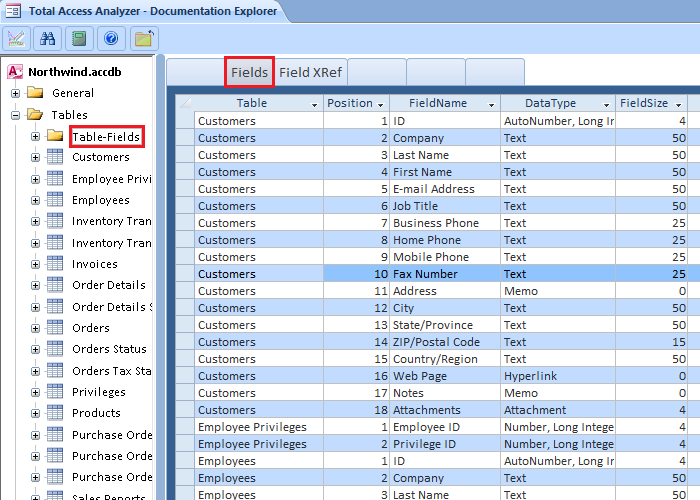 Similarly, for Tables and Queries, you can choose object level or field/column level properties. Errors, Suggestions and Performance tips are displayed in their tabs. By pressing Alt+D, you can open the current object in design mode to examine and make the recommended changes. Check the "Reviewed" box for items you don't want or need to change, so the next time the database is documented, your Reviewed status is preserved. You can even filter on the Reviewed status to see any new issues from your last run. 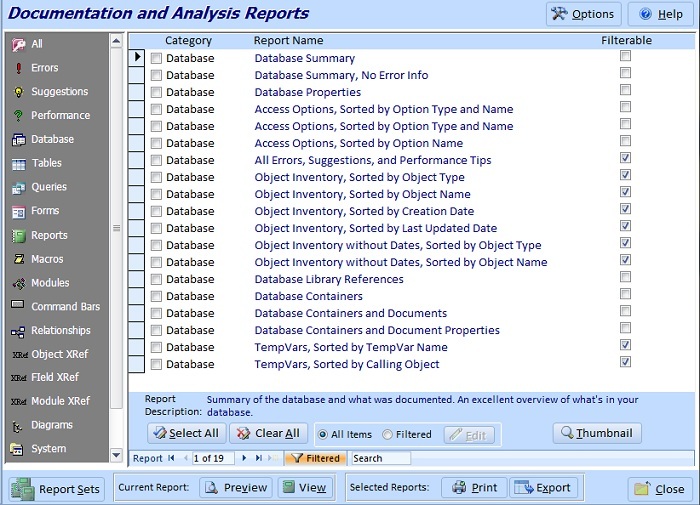 Total Access Analyzer contains 390+ reports ranging from top level overviews to individual object details. All the reports can be customized with your headers, footers, and colors so you can deliver professional documentation of your work. Many of the reports can also be filtered and you can define your own batch of reports as a set that can be easily retrieved again. As your databases grow in complexity, they become harder and harder to understand. Total Access Analyzer generates the information you need to maintain control and efficiency. 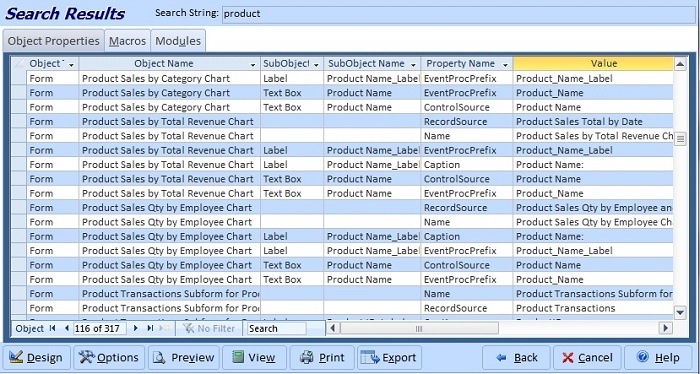 From simple table structure lists, to field dictionaries (for each field name, see every table containing that field name), to property listings, object cross-reference, flow diagrams, and code printouts, Total Access Analyzer gives you the data and reports you need to manage your systems. 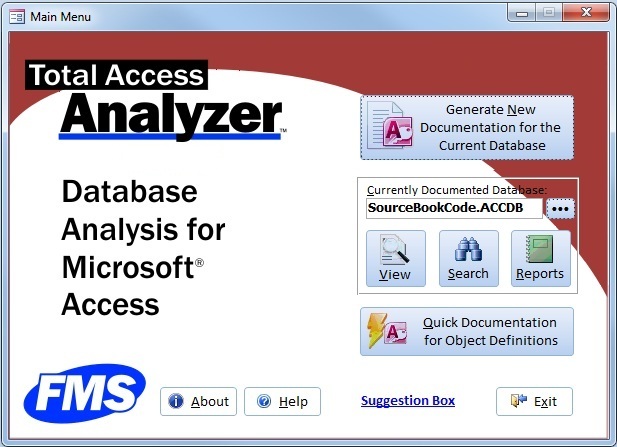 Total Access Analyzer provides the most comprehensive Access error detection for your databases. Find errors that can cause your application to crash before you ship! 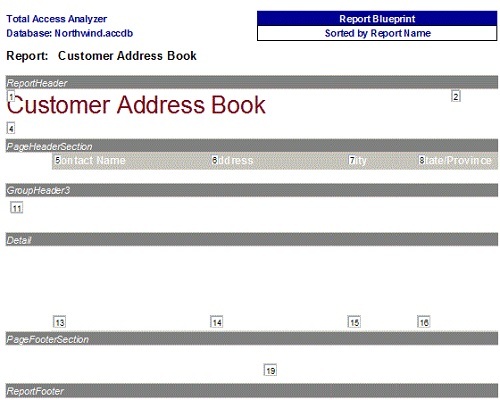 For instance, a form may have a combo box that references a table or field that was renamed. It will crash when your user opens it. Total Access Analyzer finds these hidden errors. Think of the time and embarrassment you'll save! Discover why so many organizations run Total Access Analyzer as part of their final quality assurance check before deploying any Access database. Due to the differences between Access versions, there is a separate version of Total Access Analyzer for each version of Access. It can analyze all the database formats that its Access version supports. For instance, if you are using Access 2016, Total Access Analyzer 2016 runs in Access 2016 and supports Access MDBs and ACCDB database formats created with earlier Access versions that can be opened in Access 2016. Note that Access 2013 and 2016 do not support ADPs, so if you want to analyze ADPs, use Total Access Analyzer 2010 or earlier. Simply choose the Total Access Analyzer version for the MS Access version you are running.